The basic principle for the precise results of the SUPER ID clinchem in laboratory quality is the highly specific immunoturbodimetric measuring principle in which the HbA1c value is directly determined in one analysis. Because of the direct determination, inaccuracy - as occurring in calculations in percent derived from total hemoglobin and HbA1c - is avoided. Furthermore, the device concept ensures safe operation, even in the point of care (POCT) area. Therefore, the quantitative results of the SUPER ID clinchem for HbA1c are more precise than the results of comparable analysers. With the automated procedure of dilution, mixing, incubation and measurement, the SUPER ID clinchem carries out the same analysis steps as a large medical device does. In addition, the use of reagents with the unit dose method, of easy-to-handle open-end-capillary in combination with pre-dosed sample cups, and the high calibration stability ensure precision and make the SUPER ID clinchem a reliable aide in in-vitro-diagnostics. Besides the HbA1c value, you can use the SUPER ID clinchem presently to determine total hemoglobin and glucose. More tests such as a CRP blood test and a test for microalbumine in urine are being developed. The simple update system, using data cards, enables the operator to program new tests or make modifications necessary after LOT changing in a sample manner. SUPER ID clinchem allows for up to three tests per sample run; test recognition is controlled via barcode. The SUPER ID clinchem is a cost-effective analyser allowing near patient diagnostics with analysing methods identical to those used in laboratories. It supplies results that are in one class with those supplied by clinical chemical laboratories. At present especially suited to the needs of diabetes diagnostics, the universal device concept of the SUPER ID clinchem allows stepwise upgrading to an universally employable point of care analyser. 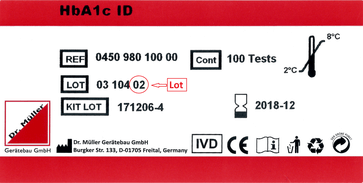 Because of its high calibration stability, the consistent use of unit dose reagents, the simple sample taking by using capillary blood as sample material, and the advantages of open-end-capillaries, the SUPER ID clinchem almost ideally combines all necessary features for employment in POCT and NPT area. Because of the employment of economic liquid reagents and a comprehensive choice of services with regard to delivery date and services, the SUPER ID clinchem enables cost-effectiveness and trouble-free operation of your practice. Due to its overall idea combining not only the performance parameters mentioned above such as precision, versatility, speed and cost-effectiveness, but also a compact build and simple operation, the SUPER ID clinchem integrates itself ideally into a near patient testing (NPT) laboratory. Set control material laboratory consisting of:SUPER GL compact, SUPER GL2, SUPER GL speedy, SUPER GL easy / SUPER GL easy+, SUPER GL ambulance 0500 988 002 001 x Trulab N 0500 988 003 001 x Trulab P 0500 988 001 006 x deionised water 10 ml 0500 988 009 001 x pipette tips blue, 50 pcs. 0500 988 008 001 x sample cups 1.5 ml clear, 50 pcs. Set for 3000 samples glucose/lactate consisting of:SUPER GL ambulance 0500 211 000 001 x Sensor glucose/lactate 3000 samples 8660 10061 x Hemolysate-System-Solution 6 x 1000ml 8666 200 003 x Glucocapil 2.0 ml / 1000 µl, 10 x 100 pcs. 9010 220 013 x end-to-end-capillaries 20 µl, 10 x 100 pcs. 8666 120 013 x Calibration solution system glucose/lactate, 1 x 100 pcs. To ensure measuring accuracy of the parameter reagent lot in use, a recalibration is necessary after a certain time. 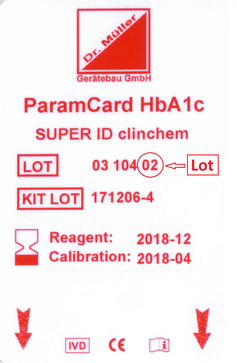 SUPER ID clinchem points to recalibration fourteen days before expiry of the calibration. To offer you a maximum calibration stability, codes for recalibration will be provided at the latest one week before the actual calibration expires. When is it necessary to recalibrate? Please choose the parameter and lot number to obtain the recalibration codes. 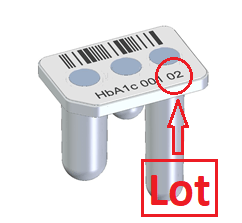 See pictures below to identify the respective reagent lot by the label on the outer package or the label on the cartridge. Instructions how to enter recalibration codes can be found in the SUPER ID clinchem manual. How to identify reagent lot? The respective reagent lot can be easily identified by the label on the outer package or the label on the cartridge.